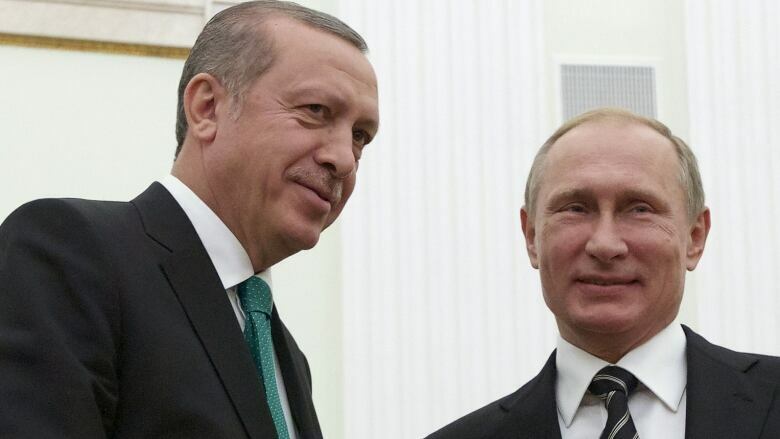 Turkish President Tayyip Erdogan warned Russia on Friday not to "play with fire", citing reports Turkish businessmen had been detained in Russia, while Moscow said it would suspend visa-free travel with Turkey. The incident has proved a distraction for the West, which is looking to build support for the U.S.-led fight against Islamic State in Syria. The nearly five-year-old Syrian civil war has been complicated by Russian air strikes in defence of President Bashar al-Assad. Turkey, which has long sought Assad's ouster, has extensive trade ties with Moscow, which could come under strain. Erdogan condemned reports that some Turkish businessmen had been detained for visa irregularities while attending a trade fair in Russia. "It is playing with fire to go as far as mistreating our citizens who have gone to Russia," Erdogan told supporters during a speech in Bayburt, in northeast Turkey. "We really attach a lot of importance to our relations with Russia ... We don't want these relations to suffer harm in any way." Erdogan has said Turkey deserves the apology because its air space was violated. Russian Foreign Minister Sergei Lavrov said on Friday Moscow would suspend its visa-free regime with Turkey as of Jan. 1, which could affect Turkey's tourism industry. Turkey's seaside resorts are among the most popular holiday destinations for Russians, who make up Turkey's largest number of tourist arrivals after Germany. An association of Russian defence factories, which includes the producers of Kalashnikov rifles, Armata tanks and Book missile systems, has recommended its members suspend buying materials from Turkey, according to a letter seen by Reuters. That could damage contracts worth hundreds of millions of dollars. Russia's agriculture ministry has already increased checks on food and agriculture imports from Turkey, in one of the first public moves to curb trade. Turkish government spokesman Numan Kurtulmus said on Friday Turkey's council of ministers was also discussing which measures to take, but that he hoped that these would not last long. "I couldn't imagine that Russia would completely abandon its relations with Turkey over such an incident," he told a news conference. "For us it's impossible for Turkey to abandon its relations with Russia over such an incident." 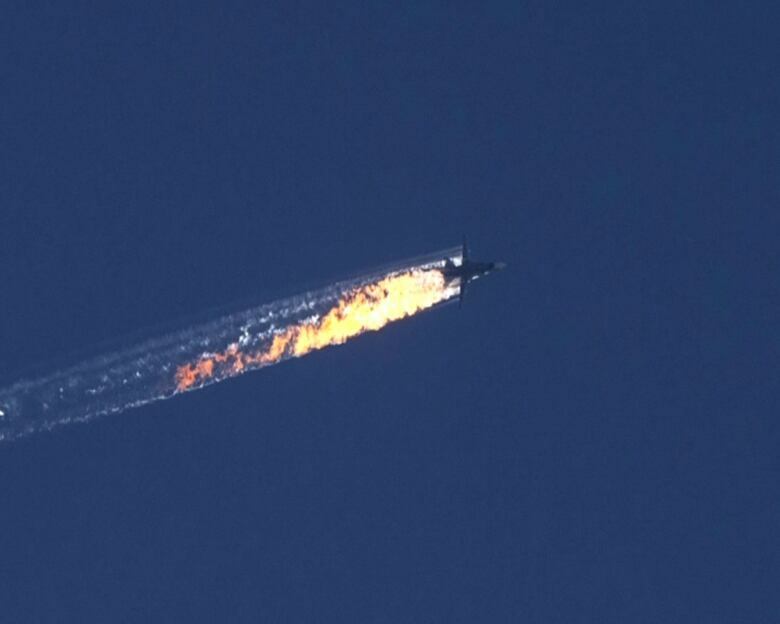 Erdogan said that Turkey did not go looking to shoot down a Russian jet but acted after it strayed into Turkish air space. It was, he said, an "automatic reaction" to standing instructions given to the military. Moscow insists the jet never left Syrian air space. Lower house speaker Sergei Naryshkin called the incident an "intentional murder" of its soldiers, saying Russia had the right to mount a military response. The incident has worsened the outlook for the Syrian peace process, dashing recent optimism following the Group of 20 meeting in Turkey where U.S. President Barack Obama held an informal meeting with Putin. "It certainly did not help," UN envoy Staffan de Mistura said. However, Putin did ask France to draw up a map of where groups fighting Islamic State militants operate in Syria in order not to bomb them, France's foreign minister said. Turkey and Russia have also traded blows over Islamic State, with each side accusing the other of being soft on terrorism. Lavrov, Moscow's foreign minister, said on Friday Russia had "more and more questions" about Ankara's commitment to eradicating terrorism. Erdogan has rejected Russia's accusations that Turkey is buying oil and gas from Islamic State, calling it "slander" and saying Turkey only made purchases from known sources. He also accused Russian companies and Islamic State of selling oil to the Syrian regime. Separately, warplanes believed to be Russian carried out several air strikes on a Syrian town near the Turkish border on Friday, a monitoring group said — one of several reported close to the boundary this week.